New research shows that a bacteria and promising microbial cell factory will not immediately shut down when deprived of nitrogen – instead 'waiting' until absolutely necessary to stop functioning. Matthias Futschik, Professor in Bioinformatics in the Plymouth University Peninsula Schools of Medicine and Dentistry, was part of the research team, and said: "When a plant is starved of nitrogen, a common exhibiting factor is the leaves turning 'yellow', which shows that photosynthesis has stopped. This also happens in cyanobacteria, which created the photosynthetic apparatus now used by plants. "Cyanobacteria perform oxygenic photosynthesis and play key roles in the global carbon and nitrogen cycles, so it's vital that we understand as much as possible about how they operate. "We were very surprised to find substantial NtcA binding associated with delayed expression changes, indicating that NtcA can reside in a poised state controlled by other factors. We previously thought the transcription factors acted straight away, but we now understand that they wait. We believe that this "waiting" is key for success in their natural environment, where nutrients such as nitrogen fluctuate frequently. "Facing a lack of nitrogen, a cyanobacterium needs to decide whether it goes into hibernation, which is associated with a severe change in metabolism, or not. The problem is that a lack of nitrogen in their habitat can last a couple of minutes, in which going into hibernation would be detrimental, especially if the other cyanobacteria around it continue to grow and divide, or the lack of nitrogen lasts for months, in which hibernation is the only way to survive. "It reminds me of the situation when you go on a hike in the countryside and it starts to rain – not a totally uncommon situation around here. You don't want turn around at the first raindrops but you also don't want to wait until a full blown storm is coming down on you. 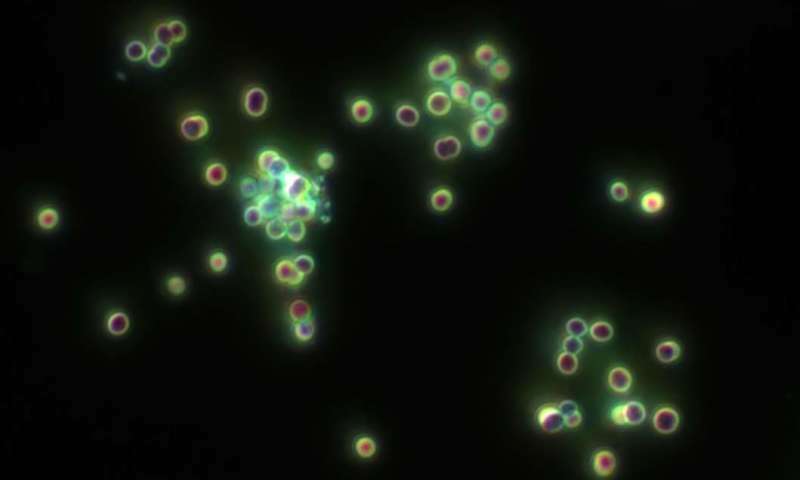 "To see that cyanobacteria have come up with a way out of this dilemma is fascinating and makes them much more elaborate than we previously thought. "We are now trying to find out how the cyanobacteria get their timing right when to make the commitment to hibernate – or to stay in the picture of the hiker, when to decide to call it a day and get out of the rain."